Wisconsin has a long and proud Olympic tradition—one that is often associated with the Winter Games. Athletes from the Badger State like Bonnie Blair, Eric Heiden, Dan Jansen, Mark Johnson, and others gained fame in speed skating and ice hockey. 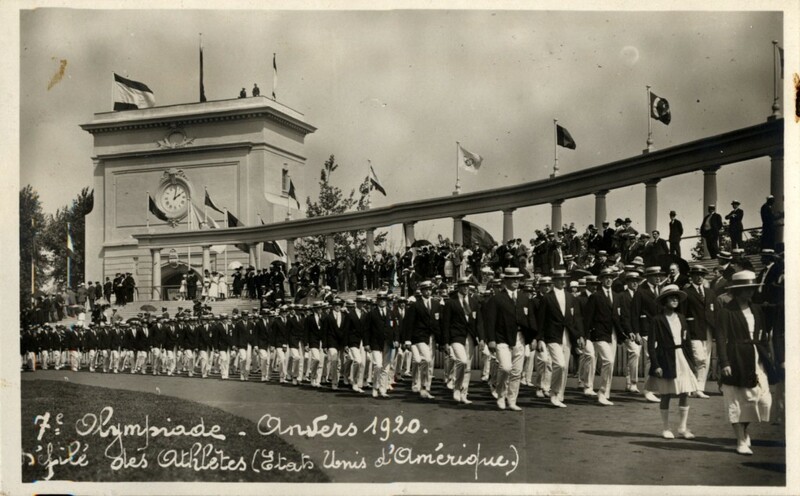 But ninety-six years ago, four years before the first Winter Olympics, a Wisconsin native participated in the Games of the VII Olympiad in Antwerp, Belgium while serving as an active duty officer in the United States Army. Carleton L. Brosius, a Milwaukee native, earned a sterling reputation as a physical trainer in the Army in the early twentieth century. His father, George, was a Civil War veteran and a celebrated gymnast who had taught thousands at the Turner Hall in Milwaukee, and the son followed in his footsteps both as a veteran and athlete. Carleton joined the Wisconsin National Guard in 1896. He served in the Spanish-American War and along the Mexican Border before accepting a commission in the Regular Army in 1917. He remained stateside during World War I, traveling between encampments to set up training regimens for soldiers. In 1918, Captain Brosius oversaw the physical training of nearly 40,000 men in nineteen Army training camps. In 1920, on the heels of World War I, Europe began the process of recovering from four years of destructive fighting. 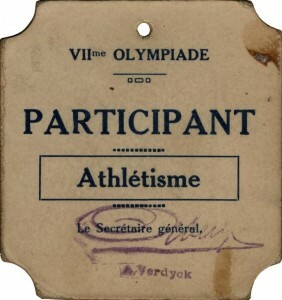 The Olympic Games, originally granted to Budapest, Hungary, were moved to Antwerp, Belgium largely to reward the people of Belgium for their suffering during the war. Opening on April 20, 1920, the games ran until September 12 of the same year – nearly 5 months! The Games of the VII Olympiad were record setting in several ways. It was the first Olympics to fly the five-ringed Olympic Flag, the first where competitors took the Olympic Oath, and the first to release doves as a sign of peace. The United States decided to use military personnel for some of its Olympic team, and Brosius was selected as captain of the tug of war team and an alternate on the fencing team. 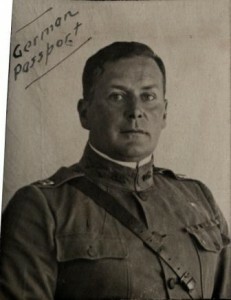 In July 1920, he accompanied hundreds of other soldiers and sailors to Europe aboard the USS Princess Matoika. 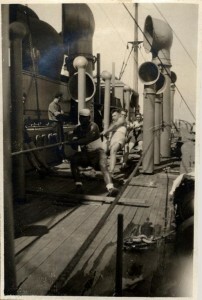 Stopping in Germany to visit friends among the American occupation troops, Brosius reached Antwerp and participated in the tug of war competition on August 17 and 18—the American team did not place. An alternate in fencing, he was not called upon to compete. Following the Olympics, Brosius served as the physical trainer at St. John’s Military Academy in Delafield before taking over the operation of Brosius Gymnasium in Milwaukee from his father. In 1936, Brosius became the adjutant at the Wisconsin Veterans Home in King, where he lived after retiring following World War II. WVM holds his military papers and Olympic scrapbooks, which document the story of a man who used his love of physical fitness to serve his country in many different ways. Watch the WVM website and facebook page this summer for more from Carl Brosius’s Olympic experience.